Mrs. Celyn Aron-Verallo, SACSI Director discussing with the participants. The Western Mindanao State University (WMSU) through the Center for Continuing Education (CCE) and Hands of Goodwill (HANDOG) conducted a Voter’s Education among student volunteers last February 18 and 19 at the Research Conference room, WMSU. Mr. Allain A. Paragas, HANDOG Coordinator said the seminar-workshop primarily aims at giving voter’s education to student volunteers and seeks to train them to be facilitators for a series of voter’s education to be conducted in different colleges within the university and in different barangays in the west coast. 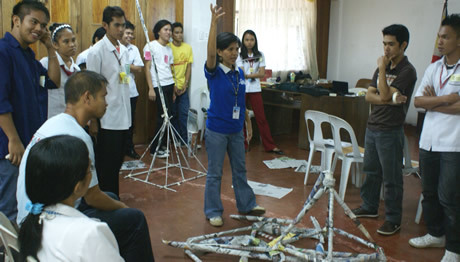 The Voter’s Education conducted by WMSU was in coordination with the Social Awareness and Community Service Involvement Office (SACSI) of Ateneo de Zamboanga University (ADZU) wherein Mrs. Celyn Aron-Verallo, SACSI Director and Ms. Cherry Mae A. Arquiza, NSTP formatter and SACSI staff served as the workshop’s facilitators. Verillo showed the plight of the Filipino people and the current situation of the country, thus underscoring the importance and impact of 2010 elections while Arquiza called on the participants to exercise their right of suffrage and urged their strong participation to ensure a peaceful and clean election. The speakers also dwelled on the crucial issue of automated election and showed how easy, simple and effective the use of Precinct Count Optical Scan (PCOS) machine is. The student volunteers engaged in a workshop wherein they were sorted into groups tasked to present a sampled presentation to prepare them to the upcoming voter’s education that they will conduct. In the afternoon on the last day of the event, the student volunteers were tasked to come up with a mapping of voter’s education which they intend to hold in different colleges in the following weeks to come.